If others could do that, so can you. Come and join this session to discover how to benefit and profit from the knowledge, skills and expertise that you already have. You don’t even need to leave your current job or business, just learn how to develop a system, approach and use the tools that will help you profit massively and exponentially from the skills, knowledge and expertise that you already have. If you are not yet doing it, you are leaving money on the table! I invite you to join this session and discover how to become a successful infopreneur. Enjoy the freedom lifestyle and exponential business development. Applied knowledge equals power, shared knowledge brings profits. Infopreneurship brings recurring revenues 24/7! Potential for recurring revenues and income 24/7 for the long term. If you are not yet benefiting and massively profiting from the skills, knowledge and expertise that you already have, if you have limited income and not yet skyrocketing your business and entrepreneurship exponentially, it is time to join this session and finally create opportunities to have the freedom lifestyle and business that you enjoy. Come and join this session to discover how and takeaway practical tools, advice and strategies that will help you to succeed. It is easy, when you know how and take action. The Success Planner book (impactful tools and valuable strategies to unlock your passion, achieve your goals and reach ultimate success) – the most active participant will receive a copy of this book. “Master the Power of LinkedIn for Your Business” Online course – prize draw, the winner’s choice – which course to take. Who is this for: Entrepreneurs, business leaders, professionals, freelancers, consultants or aspiring to be. It’s the success key to enhance your business development and recurring revenues. When: 6 June at 19:00 – 21:00. Why: Discover how to enjoy the freedom lifestyle and exponential business development. 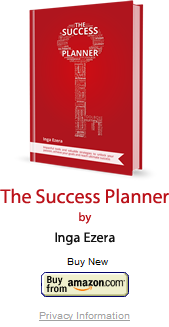 About Inga Ezera: the founder of the Success Engine company, believes, that our success engine is inside each of us – we just have to find the right gas to fuel it up. She is an empowering and inspirational Personal Brand development partner and helps ambitious and dedicated entrepreneurs, business leaders and aspiring entrepreneurs like yourself to unlock their highest aspirations, think bigger, get crystal clear clarity and success strategies to achieve their ambitions and sky rocket their business and career quicker, smarter and bolder. She is dedicated to inspire you to think bigger and to empower you to achieve your goals and take you to a place in your life where anything is possible.